I couldn’t stand it. I just couldn’t stand it. It had been weeks since I had even tried to paint anything and I was starting to feel as if I would never do it again. I opened up my Sta-wet palette and it had stayed wet enough to smell musty. Should I just dump the whole thing and start over? Well, yes, I should have but the paint was still wet, doggone it. I didn’t want to start over. If I started over, I would get bogged down in preparations and never paint. I didn’t want to never paint. Never painting again seemed like a real possibility at that point. I had wet paint. I had tiny canvases. I had a back yard with plants in it. Somehow, I would paint something. 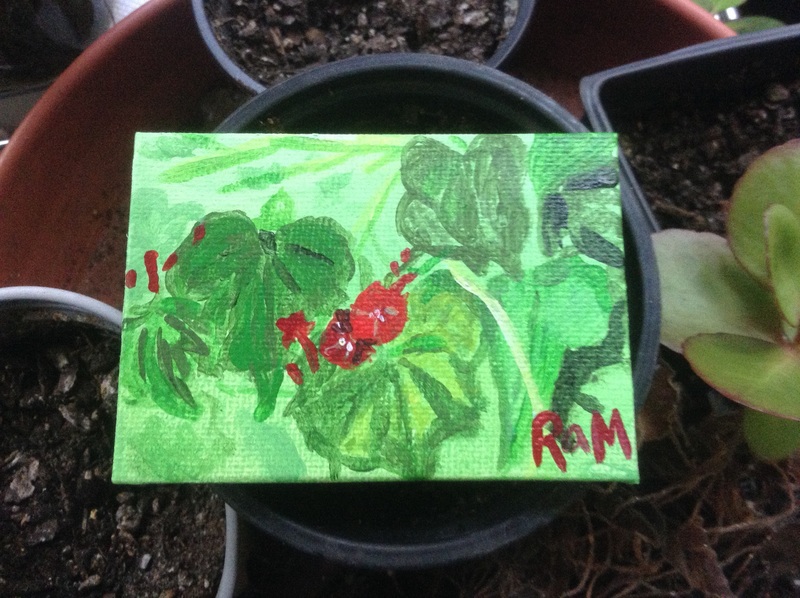 First, I grabbed a large brush and slapped some light green paint on a tiny canvas. Then I washed that brush and changed into my painting clothes (which are also my tie-dyeing clothes) while the green paint dried. I took my moldy palette, a container of water, a paper towel and two small brushes out to the back yard, along with the now-dry canvas. I looked around. My husband had cleared the overgrown garden patch I had painted a few weeks ago, but there were still some of the tiny red flowers on the fence. I decided to paint a couple of those, along with some of the heart-shaped leaves. If I tried to pull up a chair, I would not be able to see the flowers I wanted to paint, so I decided to paint standing up. It was a tiny canvas. How hard could it be? Pretty hard, actually. I didn’t have a table, so I ended up putting the palette and the container of water on the ground. Yeah. Bend down, grab some paint; stand up, brush the paint on the canvas. Squint at the flowers. Squint at the canvas. Bend down again, grab some more paint; stand up again, brush some more paint on the canvas. And so on, in the heat, for about an hour. It may look as if I slapped it together in ten minutes, but I didn’t. This tiny painting took some time. This is what desperation looks like. It’s still better than never painting again. This entry was posted in Uncategorized and tagged desperation, painting, procrastination on September 9, 2015 by releaf1954.